Ready For An Easy Tomato Salsa Recipe? I have been looking for a tomato salsa recipe that I could have any time of year and is easy to throw together at a moments notice. Using canned tomatoes is the way to achieve this and it’s way better than store bought salsa. 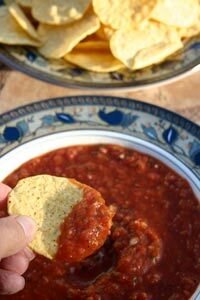 If you’ve never had homemade salsa then you must give this a try. 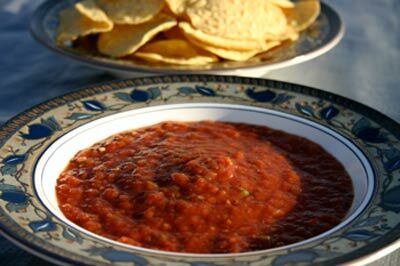 This kind of salsa, where some or all of you ingredients are cooked in some fashion, is called salsa roja or red sauce. It’s very much like the tex mex salsa I get at my favorite Mexican restaurant. The great thing is, I get to control the heat. If you are looking for salsa using all fresh ingredients, sometimes called salsa cruda or salsa fresca, check out my mexican salsa recipes for a delicious pico de gallo salsa recipe. So I started experimenting. 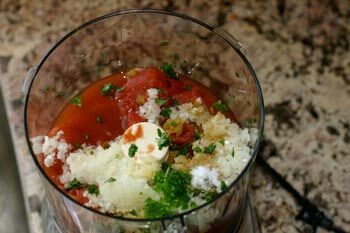 I knew I wanted this recipe to use canned tomatoes for an easy tomato salsa, so I started with regular old diced tomatoes and added a few ingredients. The result? I just wasn’t getting the flavor I wanted. I was looking for something special with irresistible flavor. It took me several attempts but I think I’ve got a tomato salsa recipe everyone will love. Obviously I think this simple salsa recipe is very tasty but as we all know there are a gazillion ways to make salsa. So feel free to substitute any ingredient you like. Here is a list of ingredients to get you started with your tomato salsa recipe if you feel like experimenting. It’s really almost an endless list. But do get started, and soon you too will be hooked! There are also different methods for preparing salsa. You can cook your ingredients by roasting your tomatoes, chile peppers, onions and garlic. This will give you a rich, smokey flavor. You can throw everything in a food processor to puree and then cook the tomato mixture in a pan on the stove. The cooking part only takes about 15 minutes. This results in a more saucy type of salsa like you might find in restaurants. Great way to use up those extra tomatoes hanging around. You can chop all of your ingredients and have things as chunky as you like. This method gives you the freshest taste. You can use a combination of the above methods as I did with this tomato salsa recipe. So play around and use whatever method suits your mood. Try these tips in your quest for the best tomato salsa recipe. Use fire roasted canned tomatoes for a richer flavor. MuirGlen is an excellent brand. 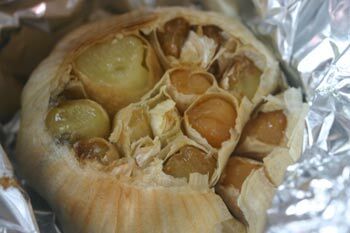 Use roasted garlic, Woo baby this makes for some great flavor. I’ll explain how to do it below. Hand chop the onion. A food processor really mushes it up and releases too much onion juice which can be over powering. Refrigerate salsa for an hour so those flavors can get intimate. If you are using a food processor, pulse very little if you like it chunky, and longer if you like it really smooth. Sounds pretty simple right? Ok, here we go. 1 can (4 oz.) green chilies. I like Ortega brand. 1/2 tsp. salt or to taste. First we are going to prep those ingredients. Remember I said to use roasted garlic? This is the one thing that takes a fair amount of time. But it’s worth it for the flavor. So jump on that right now. Preheat your oven to 375* F.
Take two garlic bulbs (you only need one for this recipe but you can save the other for another batch of salsa or try it on french bread tonight for dinner) and slice the top of the bulb off to expose the tips of all the cloves. Place the bulb on top of a piece of foil (cut side up). Drizzle with olive oil and then seal the foil up around the bulb. Place bulb directly on oven rack in the center of oven. Roast for 45 to 60 minutes. When you check the bulb after 45 minutes, you are hoping that bulb looks golden brown and the cloves are as soft as butter. If not, roast a little longer. The wonderful aroma will probably overwhelm you and you won’t be able to think of anything else. I just love that smell. Can you tell? When the garlic is done, take it out of the oven to cool. While the garlic is roasting you will be busy chopping. Not a lot of chopping mind you, just a little. You will only be chopping the onion, jalapeno, and the cilantro. Guesstimate how much of your sweet onion you should cut off. 1/4 cup is not much so maybe cut 1/2 of a small onion. I used a sweet onion for this. You can use a regular yellow onion if you don’t want to pay the extra price for the sweet. I just liked the flavor. You know I’m always chasing the flavor. 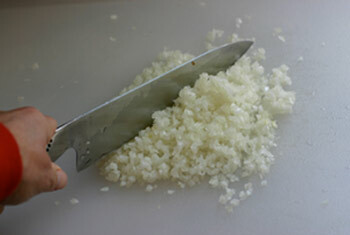 Chop your onion like this, nice and small. Remember, the onion is not going in the food processor or blender. It’s just not a good idea. By hand-chopping it, you get to determine how chuncky your onion will be. You also won’t have all that extra juice overpowering this tomato salsa recipe. Believe me, I tried it both ways. Now on to the jalapenos. 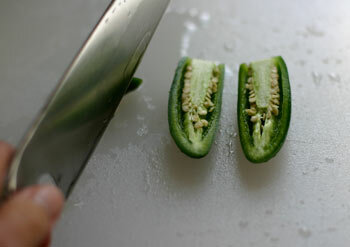 Cut off the stem end and then cut the jalapeno in half length wise.Cut each halve in half again. This makes it easier to get the seeds and membrane out. 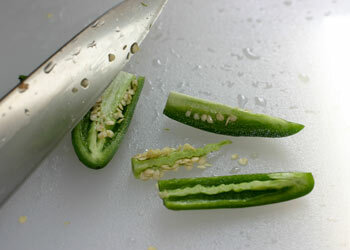 Carefully slice out those seeds or leave them in if you’re really brave and like it hot. Let me mention that I used fresh jalapeno peppers here. You can use any pepper your little heart desires. I won’t take offense. Just make sure to wash your hands when you are done chopping this up. Your eyes will thank you. I like to dice the jalapeno really small for this homemade salsa recipe. I am a little bit on the whimpy side. But if you are brave, you know what to do. The last thing to chop is the cilantro. Use as much or as little as you like. You can even substitue Italian parsley if you can’t handle the cilantro. Either one will give this tomato salsa recipe a very fresh and delightful taste. Let’s put this baby together. First you want to get that whole bulb of garlic into the food processor. It’s sort of a messy job but you can do it. There are a couple of ways to do this. I use both. I stick a pointy knife into each clove and sort of pop them out. When I get to a stubborn ones I just squeeze away. That’s when it gets sort of messy. So pop out as many as you can with a knife first, then resort to the squeezing method. Less mess that way. I got a tip for you so you aren’t walking around smelling like a garlic patch. Just rinse your hands under cold water while rubbing a stainless steel spoon all over each finger. Really, it will help. A lot. After you get all that garlic in the food processor, add the fire roasted tomatoes, the canned green chiles, the jalapeno peppers, the pinch of cumin, the salt, and the sugar. Pulse just one or two times to get things mixed. When you feel you have the consistency the way you like it, stop. Pour the salsa into your bowl and stir in the diced onion and cilantro. Cover and place in the refrigerator for an hour or more so those flavors can mingle. Pull out this tomato salsa recipe the next time you make scrambled eggs, it’s so delicious on eggs. Use it to make guacamole, serve it as a condiment for chicken, hamburgers or fish. How about substituting this homemade salsa recipe for butter and sour cream on your baked potato? That’s a heck of a way to cut the fat and not compromise on flavor. Wow. Here’s another idea, put it on your hot dogs or salad. I could go on and on. But I will stop. I hope you will try our tomato salsa recipe and use it on everything. It’s delicious and so healthy for you. I could practically live on salsa and chips. Our tomato salsa recipe is also great on our Nacho Recipe. Click here to watch our Restaurant Style Salsa video.